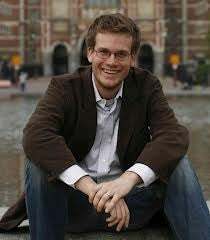 John Green is a famous young adult author and vlogger. He was nominated twice (winner once) for the Michael L. Printz, which is awarded to the "best book written for teens, based entirely on its literary merit". Since the VlogBrothers have became famous they have also gotten a budget, so some of their videos have great animation, like this one about mass incarceration in the US, which was critiqued by fellow GTer Sailor Jupiter. Besides their main YouTube channel they have also created others, like crashcourse where you can take a crash course in everything from Literature to World History to Chemistry taught by the brothers. Fans of the Green brothers and their shows are called Nerdfighters. There was some kind of controversy, right? What was that all about? GreenLit, as I like to call it, consists of realistic stories told by a funny, self-aware teenage narrator. These novels tend to have sharp dialogue, defective authority figures, occasional boozing, unrequited crushes and one or more heartbreaking twists. Basically, by attributing this to John Green, it's discounting that this style has been around before him by people that aren't white and male. Book Con is a large event in NYC this year for those ineligible to attend Book Expo American (thank you tookiedelacreme for the correction). When they released their lineup, which included John Green, people quickly noticed that there were no POC (though there is a cat, not that it helps, it's just silly). With the huge audience that JG has, he should speak up. As far as I can tell he has not spoken about this obvious disaster of a lineup. Though, after a lot of backlash you will notice there are now some POC in the lineup. So, do you recommend his books? An Abundance of Katherines (2006): UGH. I forced myself to finish this one. It's about Colin, an unpopular (and extremely annoying) high school boy who has dated 18 girls named Katherine. After the 18th Katherine dumps him, he goes on a road trip with his best friend. They find a job in the middle of nowhere Tennessee and move in with a family there. Thoughts? Are you a nerdfighter? Do you know one?